THE HYPE: So, B-Don, what happened. What made you change your mind? 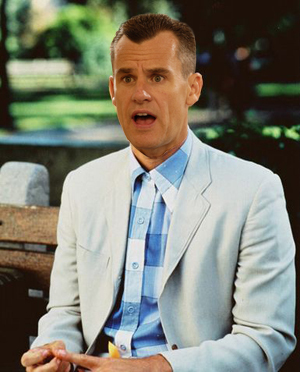 BILLY DONOVAN: Momma always said, life was like a box of chocolates. You never know what you’re gonna get. TH: Um… okay. 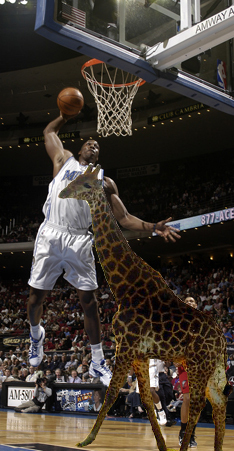 But the Orlando Magic did know what they were going to get. YOU. They were going to get you as a coach! What are you talking about? BD: Stupid is as stupid does. TH: Woah, I didn’t call you stupid sir, I respect your work tremendously. Just that this whole Magic thing was weird y’know? Any thing else you can shed light on? TH: To clear your head I’d imagine? TH: Figuratively speaking I’d assuming? And “end of town” is the metaphor of leaving the Magic organization and back to the Florida Gators? BD: …And when I got there, I figured, since I’d gone this far, I might as well turn around, just keep on going. When I got to another ocean, I figured, since I’d gone this far, I might as well just turn back, keep right on going. When I got tired, I slept. When I got hungry, I ate. When I had to go… you know… I went. BD: Have you ever been on a shrimp boat? TH: OH COME ON! That’s not even your line! What does this all mean? Nothing really, for Sternbot, it’s your annual hypnotizing of the Chinese world to love the NBA; for LeBron and Dwight Howard? They’ll finally have a chance to return their rented copies of Hello Kitty 5: Destruction at Cloud City. All in all, when this thing hits, I’m approximizing that half of kids in attendence will be wearing bananas … so thuged out yo. So I’m super doper sick with school-like symptoms with a hot fever of 2 essays that need to be done by Monday. The cure is to write 200 words in 3 hours, then goof off for next 9 hours. This recipe is flawless, and delicious. Orlando sources report that Howard has been practicing a couple wicked maneuvers that might inject this dying competition with the ingenuity/originality it desperately needs. One is a 360 throwdown with the rim hiked to 12 feet, two feet higher than regulation. The other sets the rim at 11 1/2 feet and has Howard purportedly going between his legs with the ball in mid-air before flushing. 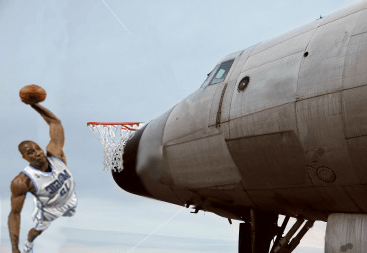 (Left) ooooh SNAP, it’s the C-141B Starlifter dunk son! Celeb All Star game: Lame, but I’m picking da East. They have Donald Faison! Chocolate Bear! Rookie Challenge: Lamer, but I’m calling ROOKS! And I’m calling an Il Mago (Andrea Bargnani) monster flush on Bogut!